You may not be an aspiring astronaut, but you’ve probably wondered — what’s the deal with rocket science? Is it that complicated? Here’s your chance to find out — take our quiz below. Its not rocket science! Or is it? All of the above. The first evidence of using gun powder in rocketry for weapons, fireworks and even alchemy came shortly after its discovery in China during the Jin Dynasty (1115–1234). Which Mongolian leader do many consider reponsible for bringing rocket technology to Western culture? Mongolia founder and leader Ghenghis Khan is thought to be responsible for bringing rocketry to the West when he conquered territory in Russia and Central and Eastern Europe in the 13th Century. Which patriotic song, written by Francis Scott Key, illustrates the trajectory of a rocket? Francis Scott Key penned the lyric, “And the rockets red glare, the bombs bursting in air,” after witnessing a battle in Chesapeake Bay during the war of 1812. The song is our national anthem. Surrendered to the U.S. at the end of WWII and later became an advocate for manned space travel. Surrendered to the U.S. at the end of WWII. Was an important scientist for Russia during the Space Race in the 1960s. Von Braun worked for the German military during WWII, but after his surrender, became an important scientist and advocate for manned space flight in the United States. Part Two, Science What are the main components of a basic rocket? A propellant, a tank, a nozzle and a parachute or streamers. A propellant, a tank, a nozzle and fins. A propellant, a tank and a nozzle. A propellant, a tank, a nozzle, a parachute and a navigation device. For a basic rocket, all you need is a propellant, a place to hold the propelant (a tank) and a nozzle. Usually, you’ll want to add something like streamers or a parachute to make sure it lands safely as well as fins or something to influence the direction it takes. Propellant is any material used to move an object — it can be solid, liquid or a combination of both. Which of the following forces do not affect rockets in flight? Thrust, gravity, lift and drag all have an effect on the flight and trajectory of a rocket. 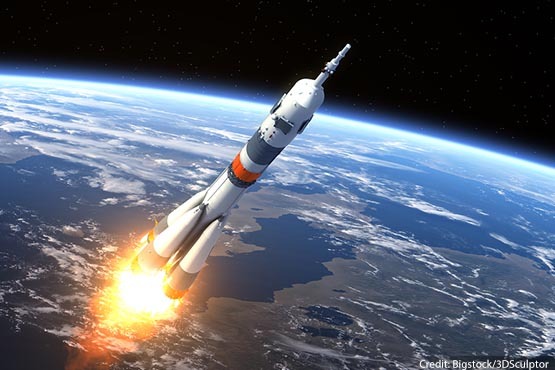 True or False: For an ideal rocket, the total mass of the vehicle should be 91 percent propellants, 3 percent tanks, engines, and fins, and 6 percent payload. True, according to NASA, 91 percent of a rocket’s mass should be propellant, while only 6 percent should account for payload — people, a cockpit, satellites, etc. How does a typical rocket land? Rockets explode into the air when they burn out. Rockets usually have parachutes or streamers attached to them that slows down their crash landing. Rockets usually stay in orbit in space after use. Unless it is used as a weapon, rockets usually have parachutes or streamers attached to them that slows down their crash landing.